The biggest problem with my last attempt to make the ciabatta recipe in the latest Cook’s Illustrated was that the dough was so wet that it was too hard to work with; more trouble than it was worth. This was mostly my fault since, not owning a stand mixer, I followed Peter Reinhart’s standard mixing style of a hand continuously dipped in water operating like a dough hook. The water prevents the dough from sticking to your hand but it also gets added to the dough, throwing off the water ratio. This time I avoided adding water at all costs. I still don’t have a stand mixer but I decided a metal spoon and my bulging biceps could take care of the mixing. I ambitiously set my timer for ten minutes and started stirring. After six minutes had passed my arm told me it was time to stop. The dough was looking pretty good, not so sloppy looking as last time. I let it rise, folding it over itself twice at half-hour intervals. Shaping the dough this time was easier; even though I know my gluten development was not what it would have been with a stand mixer, the dough was still springy enough to be easily shaped. Plenty of flour was still a must, but during shaping the dough more or less stayed where I put it. 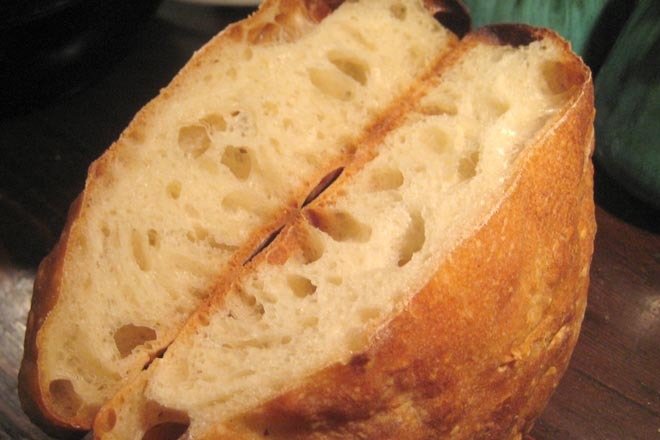 Because of its chewy, substantial texture this is a great bread for sandwiches. 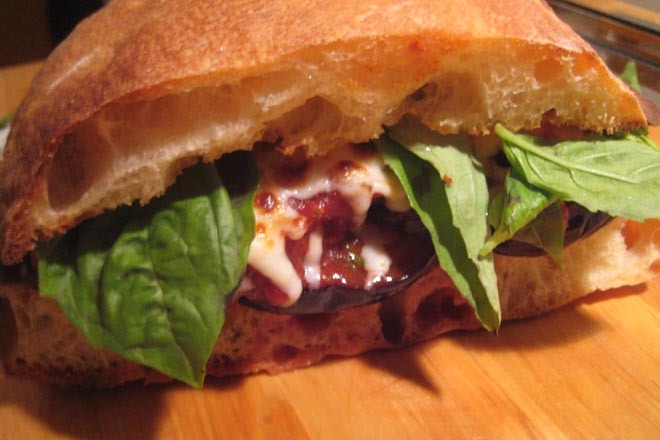 I used my first loaf for a BET: Basil, Eggplant and Tomato, with melted provolone. This entry was posted by Tom on Tuesday, March 10th, 2009 at 3:32 pm and is filed under Bread. You can subscribe to responses to this entry via RSS. Tom, This looks so amazing. Please make this when we come to visit. Bless you. All requests are honored for visitors!